ASUS have worked tirelessly on R & D, ensuring that each step they take is always forward in innovation. Now, with decades of development and experience under their belt, the PRIME range of motherboards has come to share the spoils of war. That means, raw performance and advanced controls with minimal fluff. 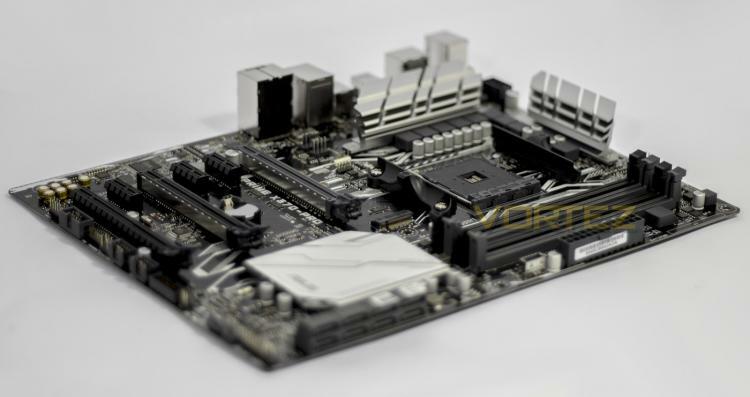 The PRIME X370 PRO comes in as amongst the cheapest X370 motherboards available and misses out some of the perks of the platform, such as SATA express, or an NVMe port, which aren't yet commonly used standards, but it does feature an M.2 socket and a front panel USB 3.1 Gen 2 header, technology that is undoubtedly becoming much more mainstream. It does away with overly fancy shrouds and excessive cooling heatsinks, but features capable cooling, ASUS 5X Protection III (ASUS SafeSlot Core, LanGuard, ASUS Over-voltage protection, ASUS Enhanced DRAM Over-current Protection, ASUS ESD Guards, and ASUS DIGI+ VRM). As it isn't just about outright processing performance, but home and media performance, so it also features Intel LAN and the Realtek A1220 high definition audio Codec. As the cherry on the cake, the PRIME still considers the aesthetic design important and so uses a neutral base colour design, but includes RGB LED lighting and an additional RGB LED strip header which can be programmed via the AURA lighting control. To ensure that people can get the very best from the motherboard with ease, ASUS have also unified their various proprietary hardware and software technologies to create 5-Way Optimization by Dual Intelligent Processors 5. So at the click of a button, your system will optimise CPU performance, cooling, and power efficiency all at once. ASUS Prime is the next evolution of the ASUS motherboard, born of a pedigree that stretches back to 1989. Our team of world-class engineers are passionate about empowering everyone to enjoy the benefits of customisation and tuning, and the driving force behind the development of Prime is to make advanced enthusiast controls easily accessible — maximising performance, stability and compatibility for the very best DIY PC experiences. Simply stated: it's time for Prime.